Who among us has not dreamt? THE ASCENT reveals the essence of the biblical story of Jacob's Dream, as we have a capacity to grow and develop throughout our lifetime. The intricately patterened stairs and golden ladders have many brightly colored angels climbing up and down. The clouds are galaxies of colors. Each one formed from many layers of fine dots and stippling. Multiple ladders and stairs lead the dreamer to see visions of universes, and expanding beauty. Every step, and rung of the ladder, is his gradual ascent from each of his life experiences and lessons. 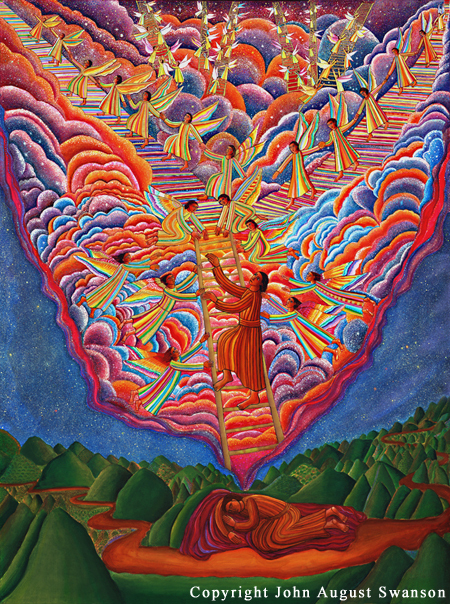 As he climbs the ladder, he is supported, encouraged and guided by angels.